What Is a High or Low Reading in Barometric Pressure? What Is an Instrument Which Measures the Pressure of a Gas or Vapor? What Are the 2 Types of Barometers? Barometers are instruments used to measure the pressure of the atmosphere. 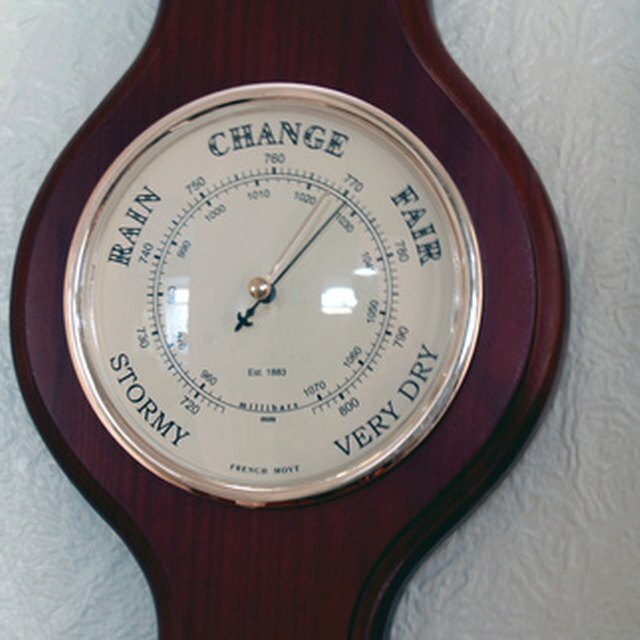 A barometer is used by meteorologists to forecast short-term changes in the weather. If the atmospheric pressure falls, storms and rain can be expected. There are two types of barometers that work differently to measure the atmospheric pressure. This weather instrument was invented by Torricelli in 1643. A mercury barometer consists of a glass column marked off in inches. The top end of this glass tube is closed, and the other end rests in a small cup of mercury, called a cistern. A column of mercury resides inside the upright glass tube. Mercury barometers are often used today in physics classes. 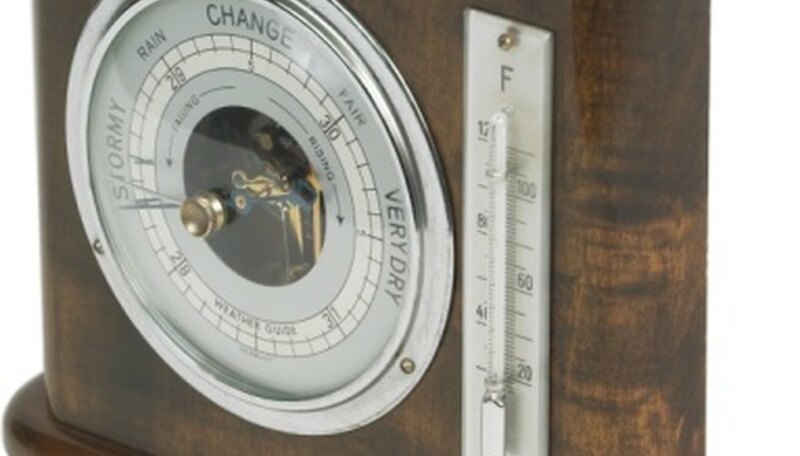 A mercury barometer will show a normal reading of mercury at about 29 inches, which is the average barometric pressure at a sea level. At the time of a storm, there is less atmospheric pressure on the cistern. The barometer in turn shows the fall in mercury levels. As the storm passes, the low atmospheric pressure is replaced with a high-pressure system, which raises the level of mercury in the mercury column. An aneroid barometer is made without fluid. It consists of a small, flexible metal box called an aneroid capsule, which is made from an alloy of beryllium and copper. The metal box is tightly sealed so that changes in atmospheric pressure outside the box cause an expansion and contraction of levers and springs inside the box. Although mercury and aneroid barometers work on the same principles of expansion and contraction, they do so differently. As compared to aneroid barometers, mercury barometers are relatively simple, although accurate. Aneroid barometers utilize a complex mechanism that can register minute changes in atmospheric pressure. Mathew, Susan. "What Are the 2 Types of Barometers?" Sciencing, https://sciencing.com/2-types-barometers-8524023.html. 24 April 2017. How Do Aneroid Barometers Work? What Units Do Barometers Measure In?